Newly uncovered documents reveal previous community outreach programs may actually have been used by law enforcement to collect intelligence on American Muslim communities. The U.S. has announced plans to roll out "Countering Violent Extremism" programs in select cities across the U.S. — including Boston, Los Angeles, and Minneapolis-Saint Paul. Although aimed at working with communities to deter U.S. residents from joining "violent extremist" groups, these programs may in fact be covertly collecting intelligence on community members. New documents uncovered under the Freedom of Information Act show community outreach programs in Minnesota were used by the FBI and local law enforcement to secretly collect intelligence on American Somali communities. 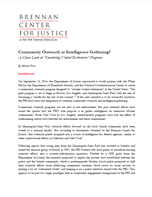 The following analysis walks through these uncovered documents and explains why mixing community outreach and intelligence gathering erodes community trust and proves counterproductive to national security efforts.